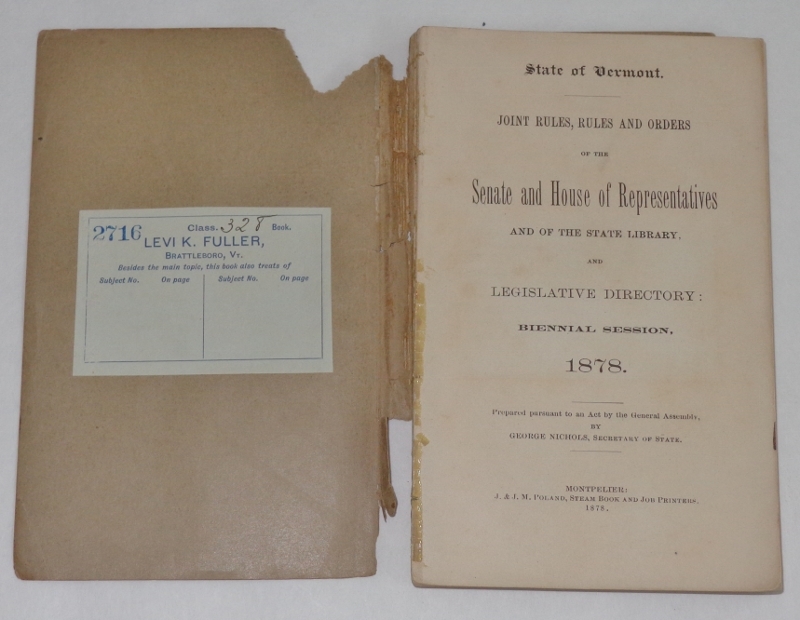 Levi K. Fuller (1841-1896) was Vermont's 44th governor, serving a two-year term upon his election in 1892. 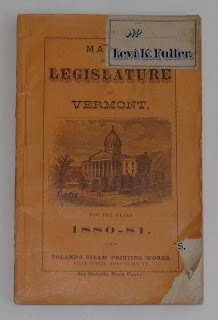 This I learned after acquiring a few old Vermont Legislature booklets with Fuller's bookplate. 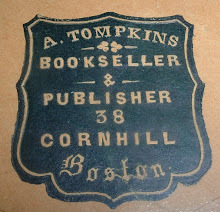 Bookplate might even be an inaccurate description of the paper pasted on the booklets. Label seems more fitting somehow given the business-like nature of these aids to finding a book's proper place when returning it to the shelf. 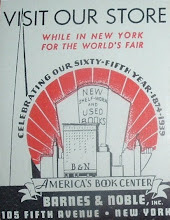 And business-like would be an accurate characterization of the man behind the name on the library label. The organization and efficiency indicated by his library served him well in his diverse pursuits of business, political, civic and philanthropic endeavors. 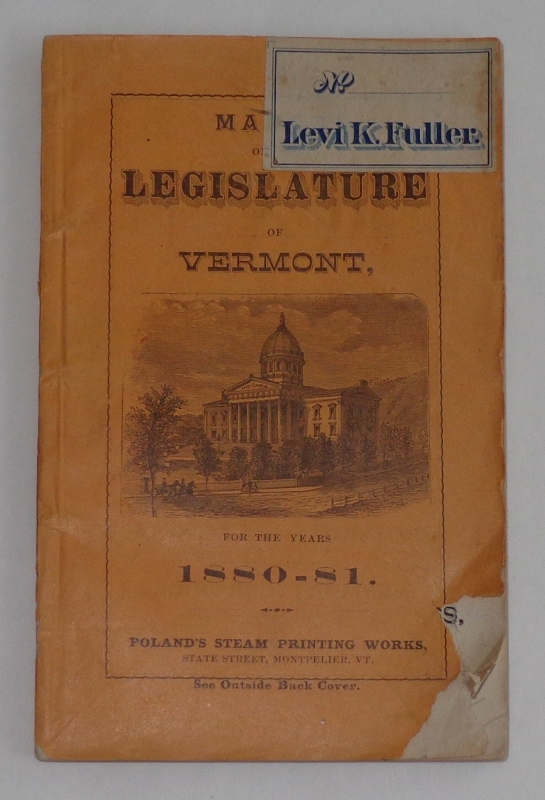 Fuller trained as a machinist and studied engineering and manufacturing, which helped him land a job with Estey Organ Company in Brattleboro, Vermont. 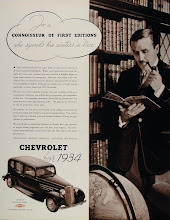 Though he married the owner's daughter, he rose through the ranks to the executive level on his own merits. He patented more than one hundred inventions, including a standard pitch adopted by musical instrument manufacturers worldwide. Fuller's accomplishments in life could have ended there and he would have enjoyed a respectable business reputation for his accomplishments at Estey Organ Company. 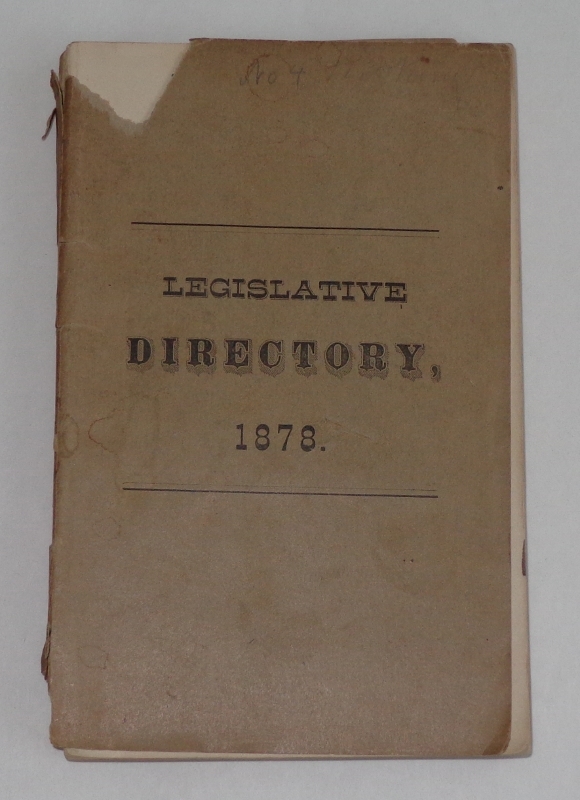 But he also became a director of the Brattleboro Savings Bank and a trustee for the Brattleboro Free Library. His library interests would not be confined to that institution. Befitting his engineering and mechanical interests, Fuller amassed one of the state's finest private libraries of scientific and technical literature. With his attraction to the sciences, Fuller developed into an avid amateur astronomer. So passionate was he about astronomy, his own observatory is not too hard to contemplate, given his engineering background and inventive work. But given that his life and business seemed locked into the Brattleboro, Vermont area, it is more difficult to imagine how he became involved in founding the South's oldest historically African American college--Shaw University in North Carolina. The oldest building on campus, Estey Hall is named for Jacob Estey, Fuller's father-in-law, whom no doubt was recruited by his son-in-law to become the largest donor to the construction of the first building for the higher education of African American women. What of Levi K. Fuller's personal library, though? 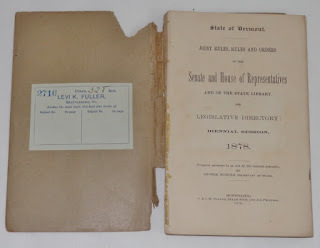 These legislature pamphlets are the only remnants I've been able to find. 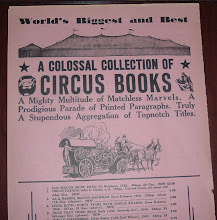 Surely, it must have been and impressive collection and I would surmise that it was donated in large part to another library. Even more impressive perhaps is that he accomplished all he did in business, science and engineering, book collecting, and philanthropic pursuits in a short (by today's standards) 55 years.